Fulminated Mercury in Sekiro is a material you need to get advanced upgrades for your Explosive Prosthetic Tool. Since you really want to upgrade your prosthetic tools as far as you can, you’ll want to know where to find Sekiro Fulminated Mercury. With that in mind, here’s our Sekiro Fulminated Mercury – How to Get Explosive Tool Advanced Upgrade guide to show you how you can obtain this upgrade material. Now is the time for me to put up a SPOILER WARNING. I will be briefly discussing some events that happen after you battle and defeat Genichiro. If you don’t want stuff spoiled for you, turn back now and come back later. 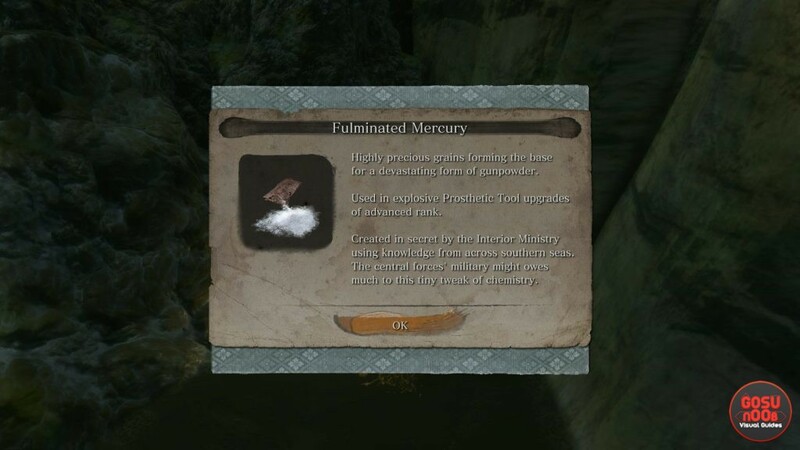 Where to Find Fulminated Mercury for Sekiro Advanced Explosive Tool Upgrade? To find Fulminated Mercury in Sekiro, which you need to get advanced upgrades for your Explosive Prosthetic Tools, there are several locations where you can attempt to farm them. According to GameFAQ member YoukaiSlayer (huge thank-you to him), you can go to the Gun Fort Idol, turn and go uphill, and sneak-kill the gunner there for a chance to get some Fulminated Mercury. The only catch is that the drop is extremely rare. According to the same comment, when the Ministry starts attacking you later in the game, almost every enemy that holding a gun has a much higher chance of dropping Fulminated Mercury. You’ll know it’s happening, because everything will be on goddamned fire; it’s hard to miss the event. Spawns near the Ashina Outskirts Stairs or Castle Ashina idols. Going back to the Gunfort Idol, going down from him gets you to a boss called Long-Armed Centipede Giraffe. Behind the statue in that room is a huge locked door. You get the key for it after killing Genichiro, then speaking with Kuro, then Lord Isshin, then go back to Kuro’s room. Proceed forward into Bodhisattva Valley. Push forward until you come across a bit of a bigger island populated by hostile monkeys. If you look around, you’ll see a large cone-shaped rock. There’s a bag containing Fulminated Mercury behind it. And that’s how you can obtain Fulminated Mercury. If we find any other source, we’ll be sure to update the guide further. If you need any further assistance, feel free to take a gander at our other Sekiro guides, including Mask Fragment Locations – Dancing Dragon Mask and Kotaro NPC Full Guide -Taro Persimmon, White Flower, Spirit Away.